Conch fritters have become one of my ultimate go-to menu choices when down in southern Florida. I had never had them (or even heard of them, for that matter) before my Chief Culinary Consultant clued me in on what I was missing. Before our first trip down to Florida together about two and a half years ago, he really talked them up, and told me I had to try them. I’m usually game for fried anything, so I promised I would give them a try. I think we ended up having them at no less than three different places that week. Needless to say, I was hooked! We just came back from our fourth trip down there, and they continue to be a staple of ours. We’ve finally settled on a favorite (Benny’s on the Beach in Lake Worth), but started talking about tackling them at home. I promised to try them before we left, and on our last night in Florida, I whipped them up. I was pleasantly surprised (shocked, really) that the flavor was dead-on and the dipping sauce was near perfection. Now there’s no excuse for waiting to get to the ocean before having conch fritters! I think I spent an entire day flipping through cookbooks and Googling conch fritter recipes. I never found one recipe that seemed like a dead ringer for the fritters we’ve grown to love, so I ended up improvising. 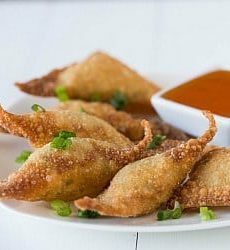 I used some basic fritter ratios of flour, baking soda, egg, and milk and then added in the ingredients and seasonings that we love. The result was an amazing, raging success. We like our conch fritters spicy, and these definitely have a nice bite, but we’d probably ratchet up the heat just a tiny bit more. The dipping sauce lends heat as well, so go by your own personal preferences. You can add or omit cayenne to get to your desired level of spice. If you’ve never had a conch fritter, I insist that you must try them the next time you see them on a menu. You won’t know how you ever ate before they came into your life! Or instead of waiting for them to appear on a menu, make them at home :) They come together really quickly – the longest part of the recipe is waiting for the oil to heat up. 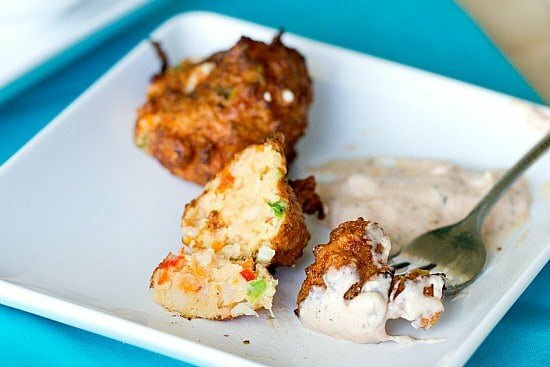 Make yourself a mojito or rum runner and have an island party in the kitchen with these conch fritters! The recipe looks AMAZING. But u am allergic to sea food, so could I substitute the conch with chicken or Broccoli ? Hi Joannea, I think you could do that without an issue! I actually used this recipe using Fresh Razor clams that we harvest. Plus added green onion, they were delicious! I paired them with a homemade tarter sauce (with plenty of dill herb, yum), as well, as a sweet chili dipping sauce (what the hell) , and wow what two great dipping sauces for these little guys! These were amazing. 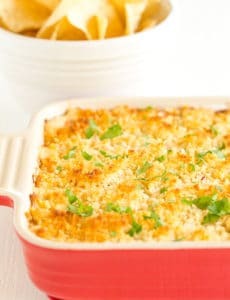 A better substitute for conch is minced clams texture is fabulous, i increased the amount of meat ( clams ) to 10 or 12 ounces and the recipe is just astonishingly good. I fooled all my friends that love conch fritters into thinking it was conch and there jaws hit the floor when i told them they were really clam! This one will be in my recipe book for many years to come. I love this and I am thinking of trying this. I live in The Bahamas…and we make conch fritters here (you can find fresh conch all the times). It doesn’t require quite the amount of ingredients you listed here ( a total of 9 for the batter and 2 for the sauce) but I can’t wait to try another version to see if it taste the same as the ones I make here. I will comment again when I do it this weekend. Latricia I am a Bahamian decent and I live in Miami, and all of what they have for the ingredients above is not called for in making conch fritters. Like you a total of nine out of all they listed is needed. 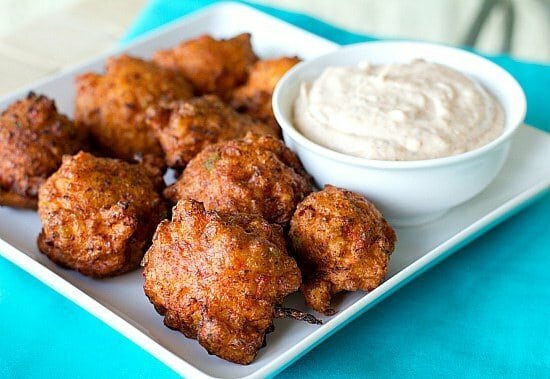 There is no carrots nor creole seasoning used in in conch fritters. Everyone adds there own twist to it, but carrots and garlic? Uh, no! Ya’ll aint check the milk in it eh! Just no! We use the water we boil the conch in for flavor and a little tomato paste. I would try this recipe minus the milk cause I know there is no way you could leave this in the fridge overnight for the flavor to develop. 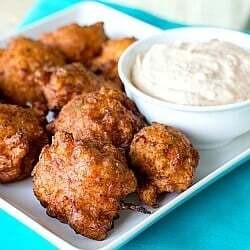 Ah conch fritters, I love them but have never made them myself. I have made conch chowder though so I am not a complete failure. I think almost all the restaurants here serve it though and the supermarkets definitely have conch (I’m from the Cayman Islands). I can’t handle too much spice but instead of jalapeno what we would most likely use are scotch bonnet peppers to add some heat :). You might not have them where you are though, not sure. I remember these from my days sailing in South Florida and the Bahamas and they are delicious–along with conch salad and cracked conch. The secret ingredient however to these puppies is the addition of tomato paste to the batter–just a suggestion. If you want to buy conch, or pretty much any other thing you can’t find in regular stores, find a good restaurant near you and make friends with the chef. Buy him a beer or two, and he will probably order whatever you need and charge you what he pays for it… I know I’ve gotten several “hard to find” items for people, you kiss have to know the right purveyor. Hi Jay, I’m not sure, but I’ve never left the batter to sit for any length of time; I just make it right before I’m about to fry the fritters. I’m guessing some type of chemical reaction caused the color change. It’s the milk reacting with the conch. 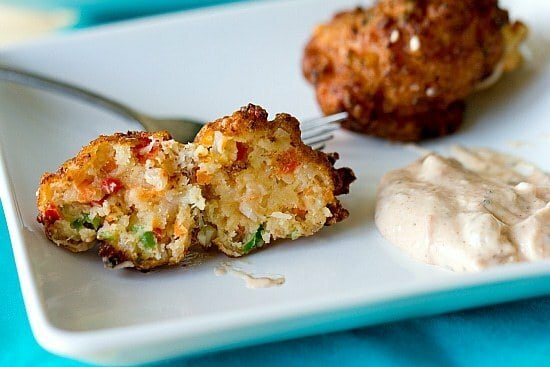 First time at your site – making clam fritters tonight and looking forward to incorporating your recipe. I love Pittsburgh and actually had conch fritters at Ray’s Marlin Beach Bar and Grill when I lived there ~ not sure it it’s still open… (FYI: it’s an “alternative” place, so some folks might not feel welcome but we had a great time – they had a little sand beach under the bar stools – so cool). 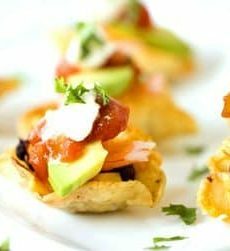 I don’t get Conch (Santorini) here but I am tempted to make these without Conch. YUM! Kaya’s conch fritters really are incredible! I’m definitely trying to replicate them!